There are 5 bands with this name: 1) Gazelle is a 2-piece South-African group from Cape Town, formed in 2006, when an acclaimed photographer Xander Ferreira started experimenting with producing electronic bedroom music. Gazelle is crossing the divides between electro, disco, funk and pop, a colorful fashion palette and a sense of pride in what African contemporary music, art and fashion can become. On the 1st of January 2009 the band have released their debut album 'Chic Afrique'. 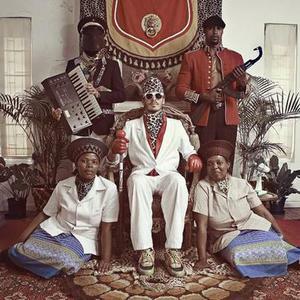 1) Gazelle is a 2-piece South-African group from Cape Town, formed in 2006, when an acclaimed photographer Xander Ferreira started experimenting with producing electronic bedroom music. Gazelle is crossing the divides between electro, disco, funk and pop, a colorful fashion palette and a sense of pride in what African contemporary music, art and fashion can become. On the 1st of January 2009 the band have released their debut album 'Chic Afrique'. 2) gazelle (please use ??????? instead) was created 16th January 2004. Their first live was played on Meguro Rokumei-kan.
Their last live was in March 2006. They were playing in Nagoya with bands like The Candy Spooky Theatre, -OZ-, CaMin and Domain. There's information that since 22th April 2006 they stopped their activity, but no one knows for how long. Fans still have hope that they will not disband finally. There are two bands with similar names, the GazettE and GazellA but besides that, there's no similarity between those bands. 5) Gazelle are a japanese jazz outfit, featuring Akira Sakata and Manubu Sakata.